In July of 2006 Ellen Hockley was trying to determine how she could be in two places at once. As Chair of Equestrian Sport for the 2006 B.C. Summer Games in Kamloops, she was expected to be present for the opening ceremonies July 27th. However, she was also Head Teamster for the Caravan Farm Theatre's production of MacBeth on the Farm's Armstrong property. Opening night was July 27th. It wasn't an easy choice. Ellen has a strong commitment to B.C. 's official horse groups. She was Vice-President of Recreational Riding, on the Horse Council of B.C., and, before that, of industry horses. She is still on the Board. 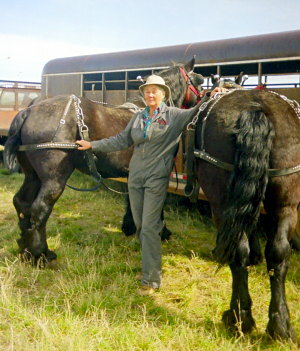 For five years she was Chair of the Light Horse Division at the Armstrong Fall Fair, and, for another five years, Chair of the Draft Horse section. On the other hand, in the winter of 2005-2006, Ellen drove a team giving sleigh rides to audiences during the Caravan Farm's winter play. By the opening night of MacBeth, Ellen had spent weeks with actors and horses working towards a smooth blend of the two at this unusual outdoor location. Involvement with the professional theatre group, and their horses, was, says Ellen," One of the most pleasing work experiences I've ever had. Sometimes I'd think 'We're getting paid to do this?'" The Caravan Farm Theatre is classed as a Canadian National Treasure. Productions don't take place in a regular theatre building. They happen all over the eighty- acre farm. Loyal, fascinated, audiences cheerfully trek from rough outdoor bleachers up a hill to sit on blankets in fields, following the actors. The Caravan showcases original plays, but even time-honoured standards are given an unusual twist. The Theatre was founded by a troupe of actors traveling in wagons pulled by Clydesdales, so, it's no surprise that horses are often integral to the action. MacBeth, as done by the Caravan Farm was bound to be unique. The emphasis in MacBeth is normally on human character. When director Estelle Shook read the play, she was struck by numerous references to horses. Shakespeare seemed to know horses well. Estelle decided to make horses, and their handlers, more prominent in the staging. Estelle went further. Not only did she plan to incorporate actual horses wherever they were referred to in the original script, she hired only female teamsters to work with them. 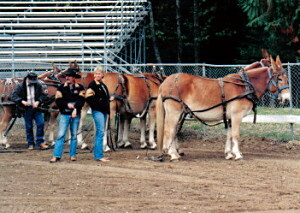 Usually people don't expect women to handle the heavy horses, although, during the winter show, of the six teams used, four were driven by women. "Women can do it; they just don't do it often enough." Ellen emphasizes. "In the old days, women had to stay in the house, make lunch and supper and carry out other domestic duties." With Ellen, Molly March, and Mahina Rose as regular teamsters, and Gillian Cran as a spare, the Caravan Theatre was already giving its own flavour to Shakespeare. All the women had worked with heavy horses before. What difference does being a woman make? "The old leather harness was really heavy. The new harness is lighter so physical strength is not so necessary." explains Ellen. "The Caravan used both types of harness. Carpenters built a chute with stairs and a platform so we could change harness really fast." Ellen admits that the size of the draft horses can be intimidating, but, when she gives workshops, "It's amazing how, after a while, the horses don't seem so tall anymore." Ellen already knew about horses. While rehearsing MacBeth she learned a lot about the theatre and actors. Some of the actors had worked with horses before: others were somewhat apprehensive before they met the teamsters and the horses. On the first day the 'horse girls' ran through every scene the horses were in so the actors knew how they had to fit in with what the horses were doing. There were long discussions between teamsters and actors about what to do and not do around horses. Ellen did workshops through April to see if the horses would do what she wanted when she wanted them to do it. A scene with liberty horses was a concern. The horses ran rapidly through trees, down a hill facing the audience. There were ropes across all the escape routes. One horse, Tom, always looked to see if the rope on the right hand side was there. Ellen says, "The big question mark was having them come in on the same spot every night for a month. So, every night, there was a mouthful of grain right in the center of the stage." The routine paid off. At dress rehearsal there was a storm In the tumult of wind, rain, lightening strikes and the flapping capes of the performers, the horses went automatically to the hitching rail.. The actors hadn't anticipated that, as soon as the horses show up, the audience isn't paying attention to anything else. A bit of a surprise. The regular Caravan horses were so 'peopleized' that nothing fazed them. People were fun for them. New horses weren't so sure about the audience. When the horses pulled the cauldron out on stage for the witches and the audience applauded, Ellen's horse always twitched. They weren't certain about the witch on stilts, either. When the witch began waving her arms the horses on either side thought, "Oh, she's mad at me!" and started to back up. "The trick is to get the horse to back up just the right distance." Lists of cues were written out and tacked to a hay bale back stage. Teamsters used the noise on stage as cover for moving horses. Timing was everything. When MacBeth and Lady MacBeth were on their thrones doing a costume change from the previous act, Ellen looked back to check that they were hanging on to the thrones to make sure not to lose them when she headed out with the horses hauling the thrones. When the horses came in, three abreast, drawing the cauldron, drivers had four minutes to unhook it, leave and be back on stage as the ride of the kings. Both horses and riders had to improvise. Once one of the actors in the ride of the kings, (Banquo's descendants), forgot to turn up for her cue. Fortunately, Steve Laughlin, Ellen's partner, was handy. Ellen threw a crown and a robe on Steve, said, "You're on that horse", and out he went to join the solemn procession. Improvisation was fundamental to the Caravan Farm's MacBeth. The fearsome, magical cauldron was really one of Ellen's old pig pots. Duncan's throne was actually a harrow cart, the decorations on its back, tines from a hay rake. A second throne used a wheel off a hay rake. Its backdrop incorporated wooden shafts from Ellen's cutter. The throne on the wagon turned into the banquet table. These were heavy props to haul, position and remove. Ellen spent most of the spring and summer of 2006 with the horses and actors at the Theatre, leaving her home, The Ranch, in Pritchard at 2:00 or 2:30 p.m., driving to the Caravan Farm in time to get the horses caught and fed. She'd have supper herself, do the play and return home about midnight. She thoroughly enjoyed it. Each evening after the show Lady MacBeth herself came and helped with the horses. Unharnessing them gave her time to calm down after the play. 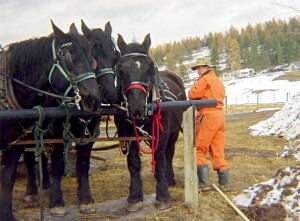 She liked the horses so much that, during the 2006 winter play, she rode 'shotgun' for Ellen, loading and unloading passengers from the sleigh and helping with the team. There were kilted pipers, of course, for every performance of "The Scottish Play". At the final windup, the pipers serenaded the teamsters at the tack shack. If the Caravan Farm Theatre altered MacBeth, the play changed how some people feel about horses. And now, in the words of the Bard, "I wish your horses swift and sure of foot; and so I do commend you to their backs. ……Hie you to horse: adieu…."